In addition to basic ClearData, clears Transfer and Management for interactive use, for mode = 0,1,2 and over 4 Plus : mode = 5 to clear Transfers (both ways) only mode = 6 to clear enforced results mode = 7 to clear transfers, results. Returns the current Context List, Null if not defined The Context is given to the TransientProcess for TransferRead. Sets a Transfer Reader, by internal ways, according mode : 0 recreates it clear, 1 clears it (does not recreate) 2 aligns Roots of TransientProcess from final Results 3 aligns final Results from Roots of TransientProcess 4 begins a new transfer (by BeginTransfer) 5 recreates TransferReader then begins a new transfer. Returns the norm controller itself. Returns the result attached to a starting entity If <mode> = 0, returns Final Result If <mode> = 1, considers Last Result If <mode> = 2, considers Final, else if absent, Last returns it as Transient, if result is not transient returns the Binder <mode> = 10,11,12 idem but returns the Binder itself (if it is not, e.g. Shape, returns the Binder) <mode> = 20, returns the ResultFromModel. Returns the name of the last Selected Norm. If none is defined, returns an empty string By default, returns the complete name of the norm If <rsc> is True, returns the short name used for resource. Selects a Norm defined by its name. A Norm is described and handled by a Controller Returns True if done, False if <normname> is unknown. The current Profile for this Norm is taken. Sets the current Context List, as a whole Sets it to the TransferReader. Selects a Norm defined by its Controller itself. Changes the Map Reader, i.e. considers that the new one defines the relevant read results (forgets the former ones) Returns True when done, False in case of bad definition, i.e. if Model from TP differs from that of Session. Changes the Map Reader, i.e. considers that the new one defines the relevant read results (forgets the former ones) Returns True when done, False if <FP> is Null. Sets a Transfer Reader, which manages transfers on reading. Returns the Transfer Reader, Null if not set. Commands the transfer of all the root entities of the model i.e. calls TransferRoot from the TransferReader with the Graph No cumulation with former calls to TransferReadOne. 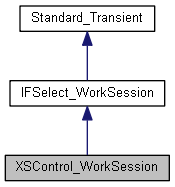 Transfers a Shape from CasCade to a model of current norm, according to the last call to SetModeWriteShape Returns status :Done if OK, Fail if error during transfer, Error if transfer badly initialised.